Is it slower than the normal fast charger? no matter how fast, there will be energy lost for such induced charging. efficiency is never 100% therefore it cannot be compared to cable charging. received the wireless charger today also.. end up now got 3 fast wireless charger.. previously 1 for home and 1 for office. now 3rd one dont know where to use. Whahaha after one week of email with samsung pay. Finally!! 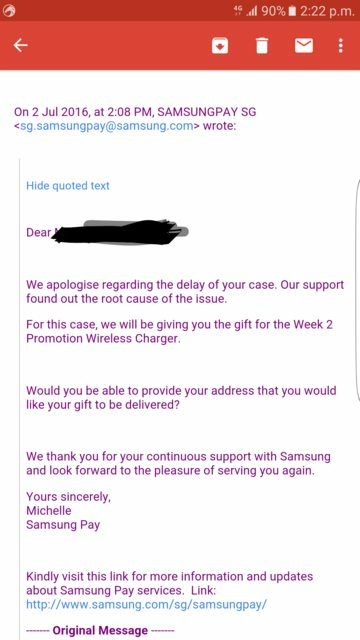 Faith restored with samsung pay again! Hahas they haven't wake up. Educate them! Last edited by nanotech25; 02-07-2016 at 04:10 PM..
Is it supported at all paywave terminals?